Trucking is one of the few industries that shares its workplace with the public. Olaco Inc. takes very seriously the added responsibility of meeting the highest health, safety, and environment (HSE) standards both on and off the road. 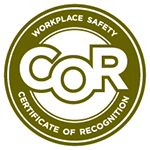 Our organization is safety-driven, and our transportation professionals regularly complete safety programs and certifications to ensure our equipment and skills meet all industry requirements.